Hello Sunshine is free from all synthetic preservatives and parabens. Natural, safe and smells delicious! See INDIVIDUAL PRODUCTS for FULL INGREDIENT LIST and more detailed information on individual products. We are head over heels in love with our Hello Sunshine range! The sunscreen glides on smoothly but is thick enough to stay on for protection. Hello Sunshine is free from all synthetic preservatives and parabens. Natural, safe and smells delicious! Many insect repellents contain harmful chemicals – ours don’t! Safe, natural and effective with organic essential oils to keep mozzies and other biting insects at bay. Bye Bye Bug doesn’t contain any harmful chemicals including DEET, Trans and Cyfluthrin, Picardin, Parabens, Mineral Oils or Synthetic fragrances. It is non greasy and is made with only natural ingredients and smells lovely! Gentle yet effective. Safe, natural and powerful protection! Shake well before use. Apply to all exposed skin. Repeated application may be necessary in infested areas. What’s in Bye Bye Bug? Natural ingredients of: Caprilic Capric Triglyceride (Derived from Coconut Oil), Lavandula Angustifolia (Lavender) Oil, Mentha Viridis (Spearmint) Leaf Oil, Cymbopogon Nardus (Citronella) Oil, Eucalyptus Globulus (Eucalyptus) Leaf Oil, Melaleuca Alternifolia (Tea Tree) Leaf Oil, Santalum Spicatum (Australian Sandalwood) Essential Oil. I am obsessed with Bye Bye Bug Spray! My 3 year old daughter has horrible reactions to mozzie bites and it is fantastic to use a product that is not only safe but actually works! So gentle on the skin and no mozzie bites since using! Love the sunscreen. Surprised by how well it goes on and not sticky or thick and greasy like most other natural ones. Havent used the bug spray yet though. Sunscreen is by far THE BEST natural sunscreen product I have tried by far. And I’ve tried a lot the kids love it because it runs in easily. I absolutely love this combo. Both products smell amazing. I have a very sensitive face and this sunscreen felt amazing on and am happy to say no itching after using it. My daughter suffers from eczema and has very sensitive skin as well as being allergic to mosquitoes. After trying so many different products, the sunscreen does not seem to irritate her skin at all and the bug spray has been like magic-the mozzies are staying away!! So pleased with both products. Both my boys have sensitive skin and where we live it’s almost impossible to play outside because of the mozzies, Bye Bye Bug gives My boys the freedom to keep playing outdoors, whilst keeping their skin safe! I purchased this recently after reading a glowing review from Alexx at Low Tox Life and I’m not disappointed. The sunscreen is easy to apply and works well. The bug spray smells great and is also soothing on bites. Both products smell amazing. The bye bye bug spray works fantastic and that’s coming from someone who gets attacked all of the time. I used the sunscreen on my son and it looked like he still got sun burnt so will have to give it another try and see. Love these products! My 6 year old daughter takes the sunscreen to school and is able to easily rub it in herself. The bug spray has been great to use on her skin too. Really great at keeping the mosquitos away and I love that it’s chemical free. Thank you! Both of these products are amazing. Used the sunscreen all last year and grabbed some more for this summer. Rubs in really well, unlike a lot of others, and great for our sensitive skin. And the bug spray is fantastic, especially for our toddler who reacts badly to mozzie bites. and they both smell awesome! We just love our new sunscreen and bug spray! It’s our first purchase and just love effective products with no nasties – for our babies and us! This sunscreen seems to work really well for all of my family of 5. Great application and smell. Kids and hubby don’t mind it too so bonus! Looking forward to trying the face stick too. Loved the cute packaging and quick delivery. Great applications smell. Kids and hubby don’t mind it! Really happy with my purchase, sunscreen applies so well, no greasy residue. Bug spray smells so good! 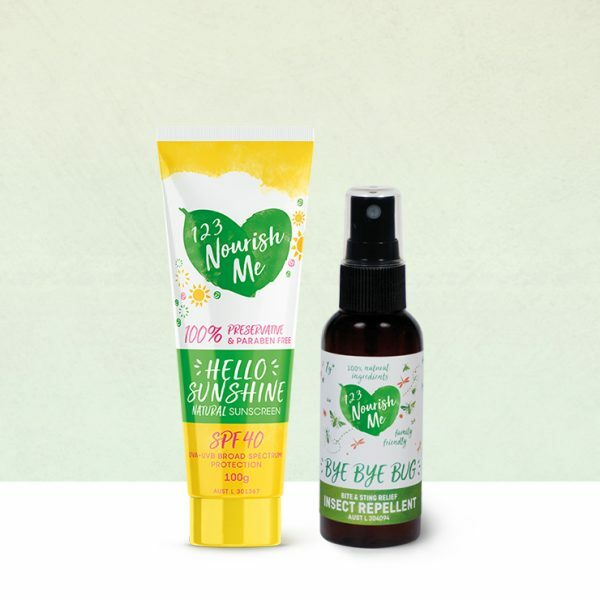 Love the bye bye bug spray and the hello sunshine sunscreen. Both go on easy, no residue, no harmful chemicals and they smell great! Love these products. We all think they smell and feel beautiful. So happy to use these natural products on my son. Great products!! So happy that I’ve found products which work, smell divine and more importantly, don’t have any nasties in them. Would happily recommend these products with confidence. The sunscreen smells delicious, and the kids love wearing it. Yet to try the bug repellant, but I’m sure it will be fantastic! Amazing! My kids generally hate sunscreen but they are happy to apply this themselves and say it smells like vanilla cupcakes!!! Doesn’t leave the skin oily and is easy to apply. The bug repellant is incredible! It honestly works a charm! I bought this pack for our trip in Thailand and will need to top up for sure for the coming summer season! Thank you for making these great products. Delightful addition to the summer arsenal. No more chemicals, and reluctance to use. Look forward to using the sunscreen and insect repellent. The sunscreen was easily applied and sank in easily. Love the smell and it works great. 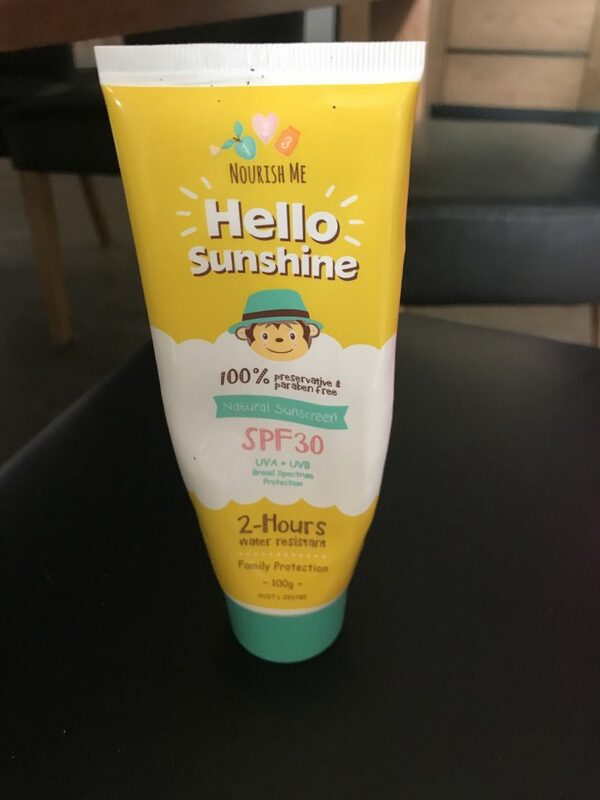 Little bit greasy to apply but so is most natural sunscreens but this one is light and my kids dont lose their minds when I put it on them! Love love love the both of these products. AMAZING, SMELLS DEVINE & IT WORKS!!!!! A lover of natural products and having used Sleepy head Balm and Chesty rub, I couldn’t wait to try the holiday pack and it is EVERYTHING we expect. The Sunscreen glides on easy and doesn’t feel heavy and the Bye bye bug absorbs well and smells devine! Thank you for the love, thought and care you not only put into your products, but also your packaging right down to the personalised Thank you! We are heading away with our little man for the first time. I wanted some safe and natural products for him. I am so impressed with both the sunscreen, which is easy to apply and the insect repellent – thank you. Love that these products use natural ingredients and they ACTUALLY WORK! Plus they smell amazing!!! Love how easy this is to apply to kids and smells great! Sunscreen is amazing! Smells so good, easy to put on, feels great on the skin. Kids love the smell too. Haven’t used the bye bye bug spray yet but am sure it will be amazing as all your products we have tried so far. Beautiful products! Sunscreen spreads great on the skin. This has worked for our whole family I’m keeping the mozzies away. My 3yr old reacts to mozzie bites and has been asking for it post being bitten (when I’ve forgotten to put it on) and it eases the itch for him too. It goes much further than I expected and smells amazing! It’s nice to spray it on knowing that it’s not full of nasties! Very happy with this product. It smells great and works well. Love this product me and my son always suffer from bites they seem to love our English skin!! Brill product Thankyou. So happy to have found this for my toddler who is reacts badly to mosquito bites. Sooo much better than the chemical stuff my husband wanted to use. And it smells amazing too! Smells absolutely divine and amazingly keeps all the bugs away. Another five star product. Thank you. Wow! What an amazing product! This 100% works in keeping mozzies away. Not only that but it also stops the itch and iritation if you have been bitten! Love it! The smell is very pleasant and this product actually works! Keeps not only mosquitos away but other insects too. Truly works but all natural. We camp in heavily mosquito-laden areas and this is the only product we need. I have tried other natural products and been very disappointed. This is now the only product I use. Thanks heaps!! This product Bye Bye Bug is amazing for protecting my family against nasty biting mosquitoes… very happy !!! No more swollen nasty bites!!! Absolutely love this stuff! A friend gave me it to try as my sons and i are very allegic to mozzie bites where we swell up and then turn into sores. This has stopped the bites and smells great. Works so much better than main stream supermarket brands of mozzie spray. Miss 2 reacts to insect bites. Every time we go out in the evening she gets bitten. And shortly after comes the welts, and then the itching. It’s horrible and nothing worked to prevent it. Until we found Bye Bye Bug that is! Yesterday was the first proper time we’ve used it since we got it. We were going to get some photos taken near a lake at sunset. There were insects and mozzies everywhere. Normally I’d be sweating thinking of all the bites she’s going to get. Normally I’d have the antihistamines on hand ready to go. Instead I sprayed her (and Miss 11 months and myself) with Bye Bye Bug and had all the confidence she wouldn’t be bitten. I wasn’t disappointed! Not a single bite between the 3 of us and we were out there for over an hour. Best of all it’s natural! Bye Bye Bug is a winner in my books! This bug spray smells divine but most importantly it works. I forgot to apply it to myself, my 1 year old and my 4 year old and we were immediately bitten by mosquitos while having our alfresco dinner. A few sprays of bye-bye bug on each of us and no more bites for the rest of our meal! Yay! Smells amazing and can apply freely on my little miss. Mozzies love us and it seams to be working. Thank you. Just wanted to say I was very impressed with your bug spray! I recently took it to Bali and normally if there’s a mozzie within 100km it will bite me! Well, I barely got any bites (comparatively speaking)!! It smelt beautiful too!! I went through the entire bottle so will now order more! Great product!! All my friends who used it didn’t get bitten at all!! Lovely fresh non insect repellent smell! My child smelt lovely and aroma lingered in room where we applied it. Wasn’t sticky when touched with hands either. Yet to test how effective in height of summer but so far am really happy with it. 5 stars. This product smells great. Can’t wait for the warmer weather to use it. I will be throwing away all the other bug sprays I have and just use bye bye bug. Smells amazing and I can’t wait to try it out when the weather warms up and the mozzies start swarming! I have no doubt it will work exactly as intended going by how effective all your other products are! So far I love all your products I have tried but I am yet to try the bye bye bug spray. Having said that I am so looking forward to trying it. Mozzies in particular absolutely love me but I really dislike the smell of the usual big sprays, and actually find that one brand seems to attract them to me. I have found one natural lotion type bug repellent but it smells no where near as nice as your bye bye bug spray…it’s smells absolutely beautiful. I am hopeful given all the positive reviews that it will keep the bugs away and if it does, this will be the only bug spray I will ever buy for the rest of my life, not only for me but the whole family. Thank you so much for making a natural product in this range, I can’t wait to try it! we have SWARMS of mozzies here that eat my 4 children alive and this stuff ACTUALLY works. i was soook skeptical but being fairly cgeap i thought why not and amazed myself.. my children dont complain about wearing it either. win win. Living in the country with lots of mosquitoes and insects around it is so nice to have a natural product that works and smells so good. THANK YOU! Aww Sarah – So glad to hear this! We are SO proud of our Bye Bye Bug! I love this insect repellent! I live among mozzies, midges and ticks, and I love not having to cringe when I think about what I’m spraying on my kids! Even my Autistic child likes the smell and the feel of it, so it really is a winner! Fabulous natural smell and feel…also repels those nasty mosquitos. Kids love it and both have one in their camping survival kit. Bye Bye Bugs! !